11th Century Bagan, land of a thousand ancient temples, lies northwest of capital city Yangon along the banks of the Irrawaddy River. The town is divided into three sections: Old Bagan, New Bagan and Nyaung U. The bulk of the temples and archaeological zone is situated in Old Bagan, as is the quiet, secluded Thiripyitsaya Sanctuary Resort. The resort is indeed a sanctuary, its riverside location and landscaped gardens a beautiful spot for the spacious bungalows. When Old Bagan was dedicated to the preservation of its important ruins, citizens residing there were relocated to New Bagan, which is now the heart of local life. Nyaung U is the “happening” area, if Bagan can be said to have one; this is where you’ll find the backpackers, guest houses, internet cafes, travel agents and Restaurant Row. Old Bagan is now almost like a natural museum, and Thiripyitsaya Sanctuary Resort is certainly the place to be if you truly want to get in touch with your inner spirit – combined with the adventure of exploring ancient temples by daytime, a la Indiana Jones. The Resort sprawls over 24 acres of landscaped gardens, which is home to mature tropical trees and flowering plants, as well as native birds and a number of small tame animals. Oriented towards the west, the Resort revels in panoramic river views, glorious sunsets and silver moonglow, and a pervading atmosphere of profound peace, warmth and comfort. 76 comfortable lodge-style bungalows are decorated in Myanmar style, with an abundance of wood and local materials; each cottage contains four individual guest suites with private entrances and roomy decks offering outdoor seating and vistas. Rooms offer wood floors, nice beds, air conditioning, fans, mini-fridge, satellite television, personal safes, mini-bars, kimonos and hair dryers. The main hall is an open-air pavilion where reception and guest services are located – the staff can arrange any number of services for you, from sightseeing tours and hot-air balloon rides to spa treatments and shopping expeditions. Scattered around are plenty of seating areas where guests can enjoy a drink or sit and read. Just behind this pavilion is the restaurant. In the morning, breakfast is served on the Terrace looking out to the pool and the Irrawaddy River. Guests can enjoy all-day alfresco dining at the Verandah surrounded by nature. In the evening, the Terrace is transformed to a romantic venue for candle-lit dining under the stars. Below this main building is the large swimming pool, with plenty of chaise lounges and a hot tub for relaxing. At the outside edge of the pool, between it and the river just beyond, the resort has set up a number of umbrellas and lounge chairs from which to take in the superb water and mountain views. Thiripyitsaya Sanctuary Resort also offers a nice-sized boutique shop that sells local handcraft items and specialty souvenirs; a full menu of spa services; and a computer for guest use. Bicycles, horse carts, hot-air balloons, horseback riding, river cruises and golf can all be arranged through the resort. The landscape all around Bagan is simply amazing – rolling green hills filled with palm trees, rice fields and ancient temples as far as the eye can see. Most date from between the 11th and 18th centuries, and the archeological zone is a UNESCO World Heritage site. Rent bicycles (around $3/day) or hire a horse cart ($15/day) to cover this vast plain of Buddhist devotion along which hundreds of temples, small and massive, dot the landscape. Don’t miss sunset from atop one of the bigger temples; it tends to be crowded with other visitors keen on the same idea, but well worth it – this is truly one of the most amazing sights any traveler can behold. Bagan is also home to the traditional art of lacquerware, a pain-staking craft deeply ingrained in the town’s fabric and used in royal palaces, temples and homes of everyday Burmese. Visit Bagan House Lacquerware Workshop or the Lacquerware Museum for a demonstration and exquisite gallery. Bagan is also home to some amazing wood-carving shops, and a small market in Nyaung U can be fun to wander. It’s an early town without much nightlife, but several restaurants in Nyaung U are open late and serve wine, beer and spirits. 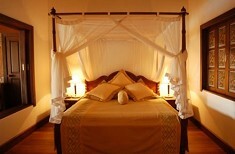 • Old Bagan is no longer inhabited except by hotel guests and staff, as it is a protected archeological zone. Therefore, it is very quiet virtually all the time and there is no nightlife. 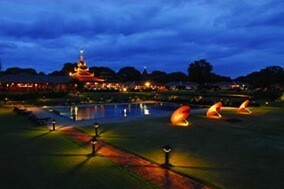 Book a car to take you to an outside restaurant or Nyaung U if you want a bit more lively scene. Music, reading material and card games recommended for evenings at the quiet resort.